I initially thought these were two sides of the same single, but Justin has corrected me. The two records have label numbers over a hundred apart, which probably means they were recorded well over a year apart, if not more. 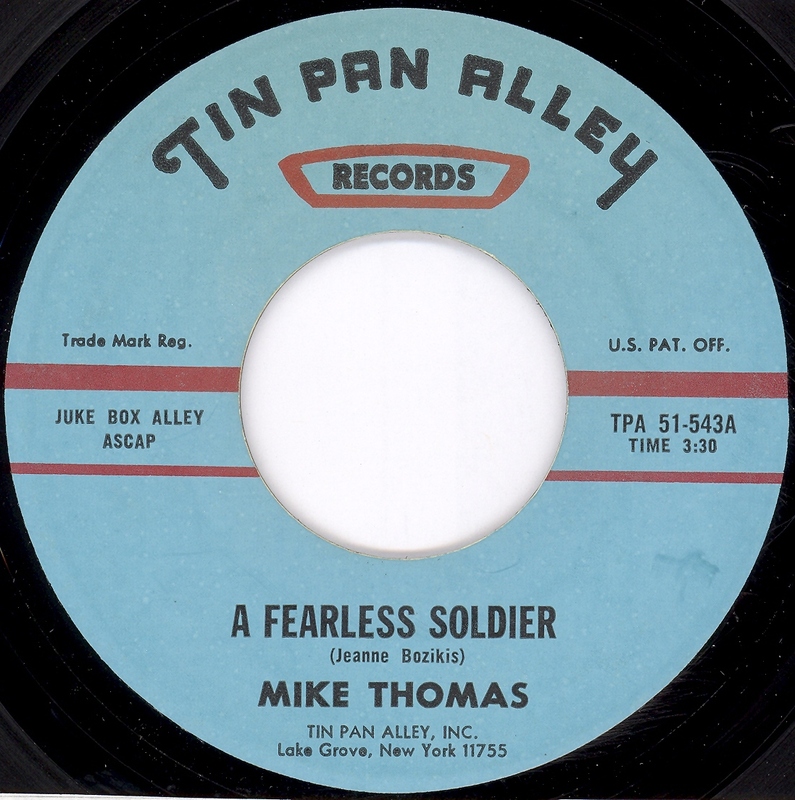 The first song is "A Fearless Soldier", a mother's tribute to his fallen son. 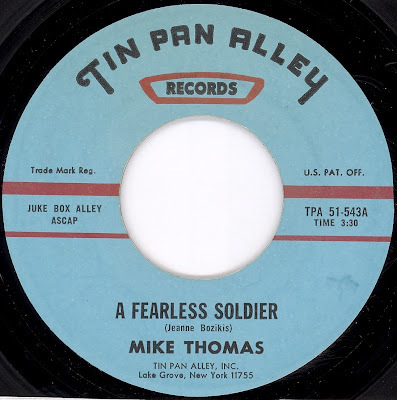 For this record, Mike Thomas seems to have dispensed with his typical loose, throwaway style of performance and to my ears sounds like he was trying to capture more of the spirit of the lyric. I don't know find his attempt all that successful, as his vocal abilities were - based on available evidence - fairly limited, but its nice to hear him trying to take seriously words that were meant to be taken seriously, and there are moments where he rises to the occasion. And I have little doubt given the heartfelt nature of these lyrics, that this author was describing a real person, and someone who she lost to the conflict in Vietnam. Certainly this has the same minimalist sound from that era at Tin Pan Alley, and yet a change of pace for them, as well - my guess is that no one wanted this to sound tossed off. The second record is "The Last Ballad of Vietnam". I've listened this three times, and find the lyrics very confusing, but I think the song-poet is offering up the idea that the Vietnam war was a right and necessary thing to do - feel free to correct me if you think I'm wrong. To be honest, when I listen to this record, my ears are drawn to the lengthy guitar solo, which takes up about a third of the record. The performer sounds clearly influences by some of the Eastern-leaning solos which had been cropping up on rock and roll records around this time, but approximating those solos is also clearly beyond his talents. It's sort of a car crash, but a mesmerizing one. 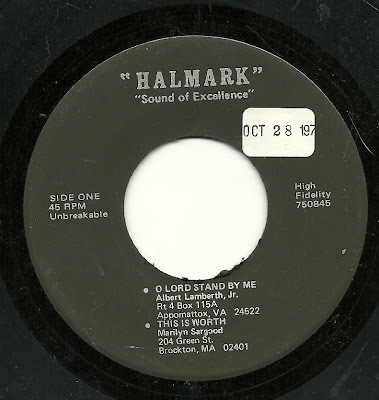 In one sense, when you pick up a Halmark record, you can be pretty sure what you're going to get. In another way though, there's no way of knowing what wonders of bad lyric writing, over the top singing or other weirdness you're going to experience. In the case of today's record, that surprise was finding the longest song-poem I've ever heard. A second surprise comes at the end of side two. But first, we get the classic backing track to "My Daddy He Died in 1969", in this case featuring the song "O Lord Stand By Me" sung by the Kimmels, Jack and Mary, in typical style. Next up is the star of our show, a song with the vague title of "This is Worth". 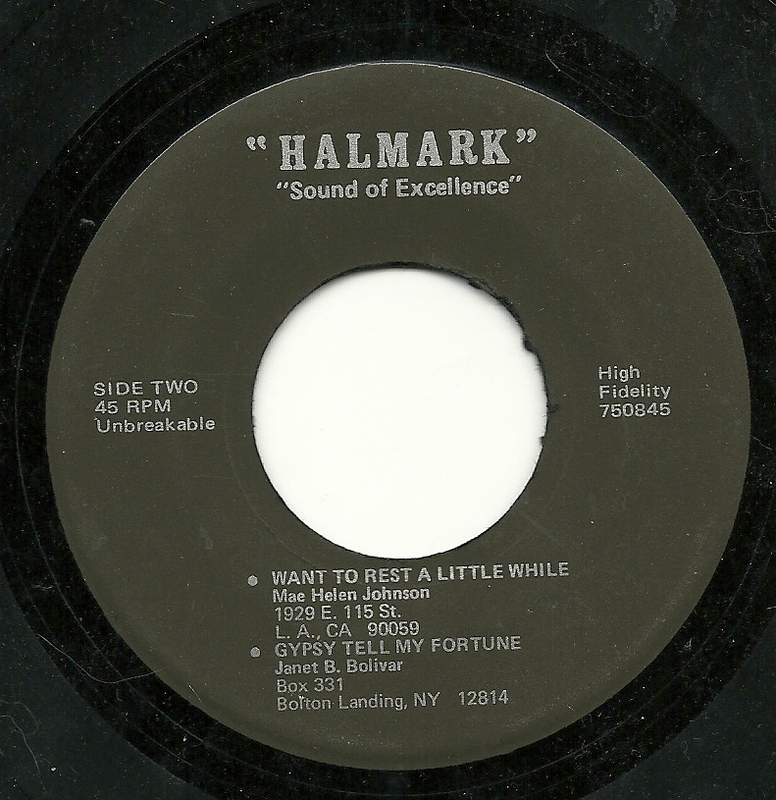 Rather amazingly, Halmark did not put this song, which is SIX MINUTES AND 19 SECONDS long, by itself on one side of a record, but rather, made it part of a nine minute side, when paired with the previous song. I assume that the backing track used here - one of the most overwrought in the Halmark catalog - has been extended via editing, but I don't have it in me to go back to other songs using this track to find out exactly where and for how long. Whatever they did, it again resulted in the need for the singer to stretch out the last few lines, repeating words here and there in order to get the last lines to occur in the right place, over the closing bars of the track. Amazing. Mind-numbing, too, but still, amazing. Side two opens with "Want to Rest a Little While", which is about as standard issue Halmark as their records can get, with a get-it-off-my-chest lyric which also features a religious aspect, sung over another of the more overwrought backing track. In this case, it's a backing track I've always loved, for its use in tandem with with the lyric of "Life is a Flame", on the first song poem I ever owned. Oddly, that record runs 4:30, which this one is well under three minutes, so "Flame" must also have utilized some looping of backing track segments. 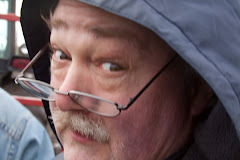 And finally, another real surprise, in the song "Gypsy Tell My Fortune". I don't recall ever having heard this backing track before (although I may have forgotten it). Instead of the typical turgid '40's style backing track, this song features what sounds to me like 1960's supper club soul and jazz. As with most other records they made, the backing still sounds like it's been recorded from the doorway of the studio. But aside from the recording quality, the track, the lead vocal, even the lyric, sound like something I'd have expected to hear on Preview, rather than Halmark. Any other thoughts on this one? It's vacation week here, and although we're still at home (we're the ones being visited by relatives), I'm still spending next to no time online, hence this posting will be short and sweet. I've only heard a handful of records on Arco, but I have really liked, or even loved, at least one side from each of those 45's. I previously featured my favorite Arco record (so far) about three years ago, here, and today's release has some similarities to that one. Again, the prime billing goes to the backing band, Joe Noto and his Diplomats, with the actual star of the show, singer Phyllis Ruby, getting second billing. 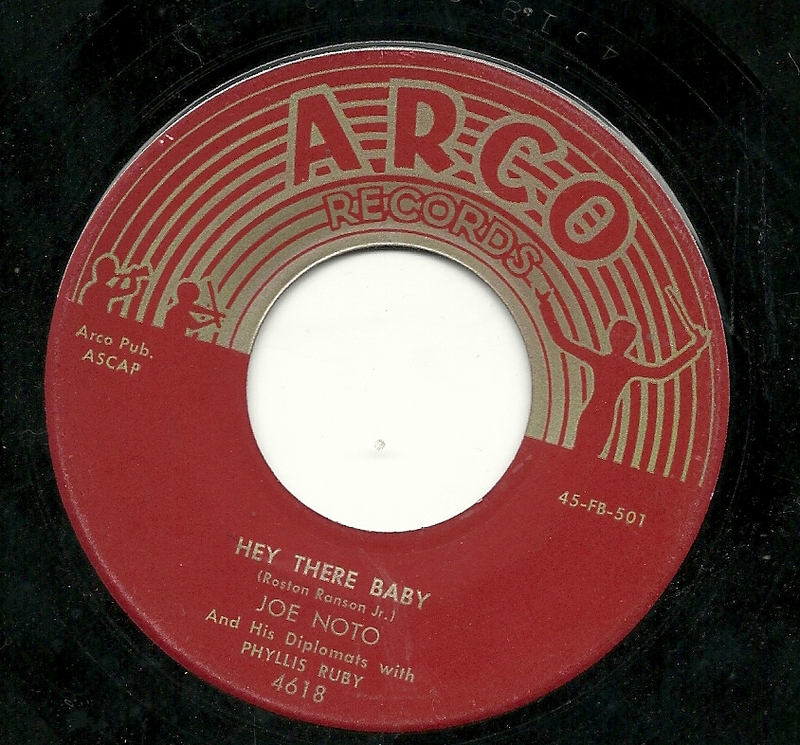 Honorable mention simple must go to the writer of "Hey There Baby", just on the strength of his rockin' name, Roston Ranson, Jr.
"Hey There Baby" is a wonderfully raucous approximation of Rock and Roll, although performed by a conglomeration which was clearly more at home with swing music. The instrumental bridge is very reminiscent of my aforementioned favorite Arco record, "My Lover". 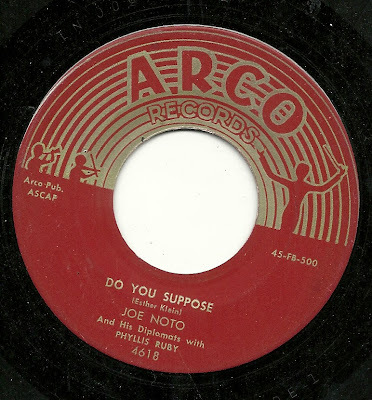 For "Do You Suppose", the Diplomats provide a nice, if sparse, Rhumba beat, while Phyllis Ruby unfortunately shows some of the limits of her abilities - I think she sounds a bit over her head, although that doesn't spoil the song for me. As they do on several of their Arco tracks, the band segues into another style of music for the instrumental section (in this case, a sort of loose Swing feel), then slip right back into the Rhumba sound for the return of the vocal. A very enjoyable disc on both sides! Sammy and John at the Hot Springs Spa! This week, we have Sammy Marshall, appearing on only one side of the disk, which comes to us on a label not recorded at the AS/PMA website, "Spa Records" out of Hot Springs, Arkansas. And look, one of the co-writers even signed the label - bet that's worth a fortune! 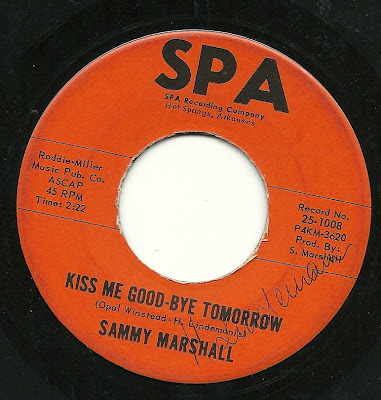 Sammy's song is "Kiss Me Good-Bye Tomorrow". I'm partial to this record, first, because the opening instrumental section is almost a carbon copy of the start of a track from a privately recorded session that I have, which I just adore (maybe I'll share that tape somewhere, someday), and second, because - within the rather hokey parameters of the day - the lyrics here are fairly well written in places, and rise above much of what came out on song-poem records, and even, in some cases, on the era's big hits. I particularly like "pretend you pretended when you said you'd leave me", and just in general, I can actually believe someone lived these words, which is a relative rarity among song-poems. The flip side features the otherwise undocumented (in terms of song poems) John Greer, who is backed up by the extremely clunkily named Puckett-Cravens-Hollihan Trio. The song's title is fairly ridiculous, too: "(Oh, Ho, Ho, Ho) Heartaches". To my ears, this record and song fairly well define the term "forgettable", as there's really nothing here, not even a single aspect of this brief rendition, that catches my ear or stays with me.